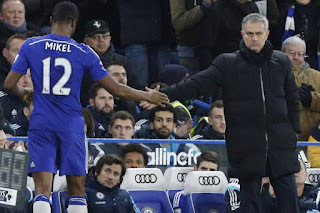 Super Eagles captain, John Obi Mikel, has revealed that former Manchester United manager, Jose Mourinho “killed” him during his time at Chelsea. Mikel Obi said Mourinho killed him because he got sent off on his first game for the Blues. According to him, he was quite slow to the pace expected of him by Mourinho in his early days at Stamford Bridge. The 31-year-old midfielder spent 11 years at Chelsea, winning the Champions League, two Premier League titles and three FA Cups before joining Chinese side, Tianjin Teda, in 2017. “Got sent off on my first game. Mourinho killed me. The speed of the game took me a while to understand it,” Mikel said. “I was a very naughty boy. I’ll get up to speed but I was late to training many times. I was wearing the wrong dress codes. “Mourinho was very firm with me because he wanted me to learn and learn very fast because he brought me in.